I'm using the concept of "How many licks does it take to get to the center?" as my mantra while I continue to seek an agent. How many licks does it take to get to the center of the publishing world? 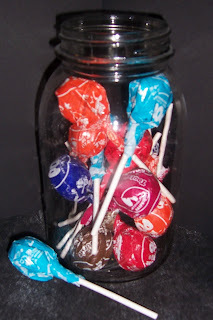 Every time an agent says, "No," I put a Tootsie Pop in the jar. Every time I write, I get to enjoy a Tootsie Pop from the jar. I nearly emptied the jar during my last revision effort, but I don't really like the brown ones. So, one brown sucker sat alone in the jar. You can see from the picture, the jar is filling again with responses from agents. I still love Tootsie Pops. I need an agent to say, "Yes! Yes! Yes!" ... okay, that might be a little too "When Harry met Sally." I'd be happy with one little "yes." ha. I'd also be happy with a bag full of Tootsie Pops that contains NO brown suckers!